I'll be speaking about the crisis in the world's oceans and in the Gulf of Maine on March 7th at the Portland Public Library here in Maine. The talk was originally to have taken place in early February, but was postponed by a winter storm. The event -- which kicks off at 6pm in the Rines Auditorium in the main library on Monument Square -- is the 2018 Sustainability Series Keynote. It's free and open to the public. 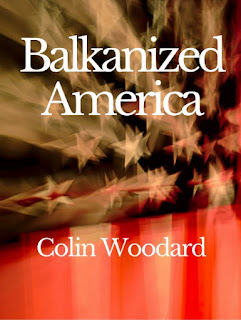 As a foreign correspondent, I long focused on oceans policy and global environmental reporting, and my first book, Ocean's End: Travels Through Endangered Seas, took me to Antarctica, the tiny atoll states of Central Pacific, the coral reefs of Belize, the depleted cod banks of Newfoundland and the troubled waters of the Gulf of Mexico and the Black Sea. My second book, The Lobster Coast, told the story of coastal Maine and its ecosystem, and "Mayday," a 2015 series I wrote for the Portland Press Herald, was a finalist for the 2016 Pulitzer Prize for Explanatory Reporting. I'll be speaking about the nature of the multi-faceted marine crisis, what it means for humans, and what might be done about it. Hope you can make it. Senator Angus King, I-Maine, came by the Press Herald newsroom last week for a wide-ranging, on-record conversation with myself and my colleagues about everything from the state of the immigration debate to prospects for modest gun control legislation on Capitol Hill and even why he's not interested in joining the Democrats, who he caucuses with. But the most pressing issue he wanted to talk about was the ongoing threat posed by Russian cyber attacks on our election infrastructure, which he says remain insufficiently addressed ahead of the 2018 midterms. The President, he argues, has not only declined to marshall a cross-government response, he's made matters worse by encouraging the public to regard Russian attacks as a hoax. It's all in the piece, which ran in yesterday's print edition. For more background on King's concerns with attacks on our election systems, there's this piece from an extended interview I did with the senator last year. On Maine's system -- relatively invulnerable to such attacks because of its intentionally low-tech design -- start with this interview with the state's top election's official, Secretary of State Matthew Dunlap. The U.S. intelligence community has been warning elected officials and the public for some time now about the past, present, and future threat Russia has posed to the integrity of election infrastructure. In yesterday's Portland Press Herald, I report on an unprecedented briefing by the FBI, Department of Homeland Security, and the office of the Director of National Intelligence on the matter given to Maine Secretary of State Matthew Dunlap and nine other members of the executive board of the national association for secretaries of state. I spoke to Dunlap for the story, and you can read his thoughts and message in the piece. Dunlap is known nationally for his role in the closure of President Trump's controversial election fraud commission, on which he was a member. His suit to obtain working documents from the group -- which he says he and other Democratic commissioners were denied -- is still in federal court. 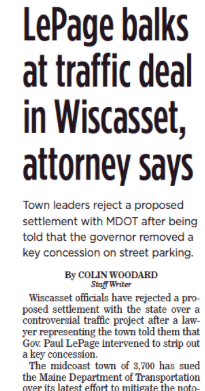 Maine Governor Paul LePage personally intervened to kill a compromise between the state transportation department and the town of Wiscasset over a controversial traffic project there, an attorney for the town told residents this week. I have the details in today's Portland Press Herald, which is also available online here. For fuller background on the project, this story lays it all out, including the governor's chain of aggressive correspondence with constituents about the traffic problems in the midcoast town and how the Maine DOT lost the confidence of town residents after reneging on promises made about the project, including the use of federal funds and the historic preservation reviews that come with them. Last year, President Trump tried to eliminate a wide range of programs with an outsized impact in Maine, including Sea Grant, low income heating assistance, community block grants, the National Estuarine Reserve system, the Corporation for Public Broadcasting, and Legal Services Corporation, a major funding source for Pine Tree Legal Assistance. Congress ultimately told him to pound sand. Yesterday, his new budget proposes again to eliminate these and other programs. 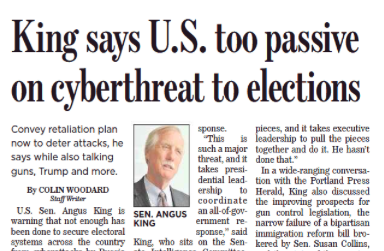 As I report in today's Portland Press Herald, Maine's Congressional delegation -- from conservative Republican Bruce Poliquin to liberal democrat Chellie Pingree and more centrist US Senators in between -- is not on board. My latest installment of the "Balkanized America" series is up over at Medium, this one interpreting what happened in the 2016 presidential election via an American Nations lens, with some lessons for what this means for the president's popularity going into this years' midterm elections. I'll be speaking about the crisis in the world's oceans and in the Gulf of Maine on February 7th at the Portland Public Library here in Maine. The talk -- which kicks off at 6pm in the Rines Auditorium in the main library on Monument Square -- is the 2018 Sustainability Series Keynote. It's free and open to the public.